On the last Saturday in May, I went fishing for the first time ever, and what a day that turned out to be! Armed with a new rod & reel, and an Environment Agency day rod licence purchased from the onsite tackle shop, we set off on one of the boats you can hire from the fishing lodge on Rutland Water. With the outboard motor chugging behind us, we set off along the reservoir towards Manton Bay which is located on the south arm of the Water. We pulled into a nice little spot, anchored and prepared to start fishing. As complete novice, my fishing partner promised to teach me the basics, and gave me some quick instructions on how to fish the “Fly” and the correct way to retrieve it to mimic natural prey. I had not yet had the lesson on how to land a fish, but I was soon about too! On my third cast ever, I hooked a powerful big fish which bent the rod double. I screamed, panicked and shouted at the top of my lungs “What do I do!” Luckily my fishing partner held his nerve and calmly talked me through on what to do by instructing me with phrases like “keep the rod up”, “keep the line tight” & “Give it line, if it runs”. After a 10 minute fight, which felt like an hour, I pulled the fish over the landing net and we hauled it into the boat. 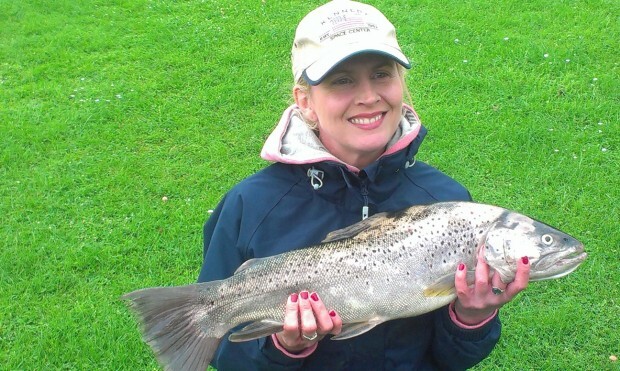 Wow, and what a fish it was, a beautiful specimen brown trout weighing in at 7Ibs and 10½ oz. I caught it on a Crackton nymph presented on a floating line with only an 8lbs breaking strain leader, so I was lucky the fish did not snap my line! The buzz and thrill you get from playing a big fish is unbelievable, I was visibly shaking with adrenaline after the fight, you’ve got to try it! Once ashore again, the Warden weighed the fish for me, praised its size and scribbled the details into his log books. The weekly Rutland Water fishing report recorded my fish as being the biggest one caught that week, what a start to my Angling career! If you have a rod licence you can take a friend fishing for free from Monday, June 16 to Sunday, June 22. To take part, print the rod licence voucher form, fill in the person’s details, validate it online at http://www.takeafriendfishing.co.uk/offers/free-rod-licence-voucher/ and read the terms and conditions. Or how about buying your Dad one for Fathers Day?